Meet our inspiring Bat Ambassadors! Paul is Regius Professor of Natural History (Emeritus), University of Aberdeen, and Visiting Professor at the University of Exeter’s Centre for Ecology and Conservation, which is located at the Tremough campus, Penryn, near Falmouth. When he retired in 2009 he was awarded a Leverhulme Emeritus Fellowship to continue with projects on bat ecology and conservation in Madagascar. Paul’s infectious passion for bats (and Africa) have inspired many bat ecologists, and enabled many bat projects to get underway. Paul was one of the founders of the UK’s Bat Conservation Trust and served as its first chair for six years. He was a council member for Fauna and Flora International for 22 years and was Vice-Chair when he retired from FFI last year. He has served on several scientific committees and advisory boards of conservation NGOs Bat Conservation International and the Lubee Bat Conservancy). 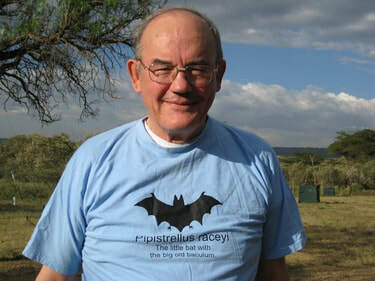 As an internationally renowned bat expert and ambassador, Paul’s outstanding service and contribution to bat ecology and conservation have been recognised with the silver medal of the Mammal Society (UK), honorary membership of the American Society of Mammalogists, the Gerrit Miller Award of the North American Society for Bat Research, a lifetime achievement award from the Bat Conservation Trust, and in 2008 Paul was named one of the BBC Wildlife ‘Conservation Heroes’! So… to say we’re a bit excited Paul is one of our bat ambassadors might be a teeny bit of an understatement. We've absolutely over the moon! No such thing as a typical day in retirement. A fascination with dusk ,when one group of aerial vertebrates goes to sleep and another wakes up. Its from TS Elliot’s Four Quartets and may not be quite accurate but its a good lesson in scientific humility! 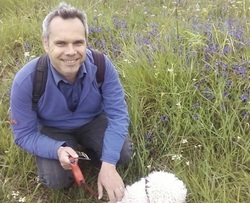 Gareth graduated from the University of London with a degree in Ecology, and then did his PhD on the behavioural ecology of birds at the University of Stirling. Moving to the University of Bristol in 1985 Gareth's career on bats began with a study on the aerodynamics of bat flight. He was awarded a Royal Society University Research Fellowship combining his interests in ecology, behaviour and bat biology. Most bat researchers in the UK and researchers from a dozen countries have at some point worked in Gareth's lab either as PhD students or postdocs. Gareth has worked on bats on 6 continents, including recent projects in China, Madagascar, Malaysia, Namibia, Botswana, Malawi and Colombia. In 2011 Gareth was awarded the Gerrit S. Miller Award at the North American Symposium on Bat Research held at the University of Toronto in recognition of "outstanding service and contribution to the field of chiropteran biology." In 2010 he received the Ig Nobel Prize in Biology, awarded in Harvard for science that first makes people laugh, and then makes them think. Gareth's recent research has focused on conservation biology, especially global change biology and molecular ecology. Partly by chance. I’d just finished a PhD on bird behaviour, and was offered a postdoc working on the aerodynamics of bat flight. My main interests have always been in behaviour, ecology and conservation, so I able to combine these with my new fascination for bats when I was offered a Royal Society Research Fellowship at Bristol. If you were another animal what would you be? I’m fascinated by how other organisms perceive the world. I would like to start by being another human – if only to see the world through someone else’s eyes – and then something with extreme sensory adaptations. Of course it would be interesting to understand ‘What is it like to be a bat?’, especially by flying and echolocating, although a platypus using electrolocation underwater would be fun too. Lecturing on a trip for university alumni around Galapagos. The history, tame wildlife, scenery, weather, sea cruises and socialising were wonderful. 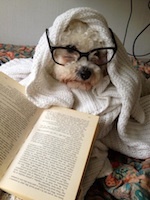 I have a very friendly Bichon Frisé dog called Max.